Don't you just LOVE this set? 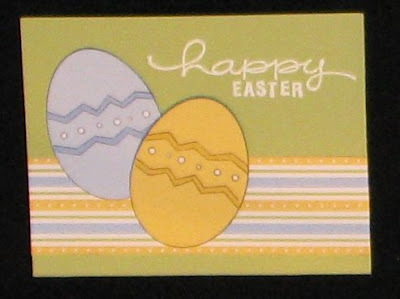 I'm planning on ordering it in April as one of the 10 free sets I earned with Stampin' Up! during the Sale-A-Bration period - can't wait to bring it out at May's Club dates for you all to play with! Today is Monday March 31, and we are due to arrive in Bermuda at 8am. Today's excursion is to the Bermuda Aquarium, Museum and Zoo and then the Crystal Caves. If you're in Canada -- you'll DEFINITELY want to take advantage of my super duper Stampin' Up! CRUISE SPECIAL, no shipping/handling or taxes -- yippee! Some more samples to inspire you, this time from the "Embrace Life" set! Today is Sunday March 30, so we'll be at sea all day, with tons of swaps planned, our General Assembly with Shelli and our then first Formal evening! One last little post before we leave for the airport at 7:30am...we're flying out for an early day in New York City before catching our ship around lunchtime on Saturday. I actually expect to have FUN at the airport this morning... how can that be when you're waiting around 2 hours for an International departure, you might ask??? Well, that's easy -- my downline Dina & her family will be travelling on the same flight as us, and it's always a party when you're with her. I've rented "The Wild" for the kidlet's to watch from Brent's laptop in preparation for the Central Park Zoo, so I expect they and Dina's daughter Elina will be kept busy. Please wish us good weather and relaxed Border agents! 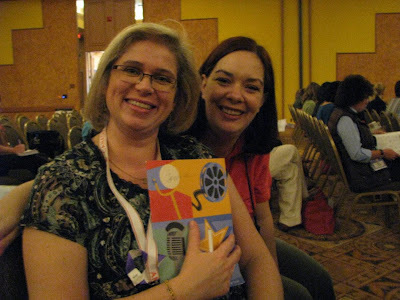 Once in NY, I'll be hooking up with my downline Marika from Crabtree, Quebec -- I haven't seen her since September at the Founder's Circle retreat. Oooh... can't wait! HAPPY STAMPING & BON VOYAGE! My cruising special for you -- FREE S&H and NO TAXES! 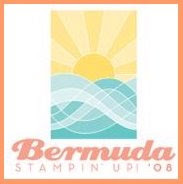 It's that time again... when I make last minute preparations for my family and I to leave on another great adventure (NYC and then a cruise to Bermuda, courtesy of Stampin' Up!). You didn't think I'd forget about YOU in all that rushing around, did you? No way, since I've been thinking about you guys all week long. Who would have thought that in the past 6 years I'd be so lucky to receive many rewards from being a part of this company, both tangible and intangible? I've made some of the most fabulous new friends amongst my customers and downline, increased my scrapbooking and stamping skills BIG TIME, travelled all over the place and earned free trips to boot. FREE SHIPPING & HANDLING AND NO TAXES, ANYWHERE IN CANADA! Yup, it's a doozy of a sale (or should that be "sail"?? LOL)! You can read all the details HERE and then just contact me by phone or email before midnight Sunday April 6. HAPPY STAMPING & THANKS FOR EVERYTHING! I have only 5 minutes for the computer today, so I'll have to be quick! Now that all the Easter festivities and visiting are over with, it was Family Swap Mayhem day with EVERYONE working on their swaps. 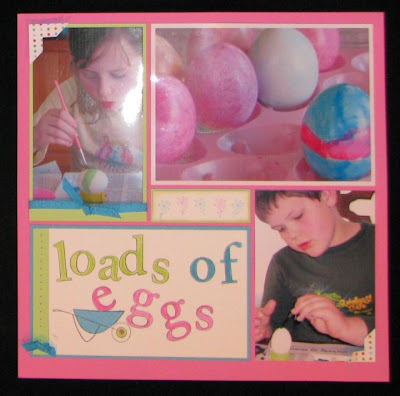 Both Morgan and Serena have signed up to participate in the kid's 3-D swaps, and opted for altered candy as their projects. 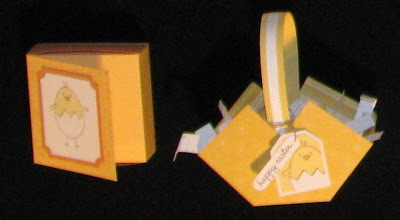 Please note, every last piece was stamped and assembled by them... my skills were utilised for cardstock measuring/chopping and ribbon-tieing only. But what was Brent working on???? Hmmmm... that's the big secret, it would appear. He's participating in the Husband Swap (which sounds much more extreme than it is in fact) and was busy concocting his swap creations. He declined to have his work of art leaked on the Internet though, lest the other demo hubbys copy his work (snort). I guess we'll just need to wait until I get photos of the swapping itself! I'll be back in the studio tomorrow and will return with more of my cruise swap to share. Until then, happy stamping! 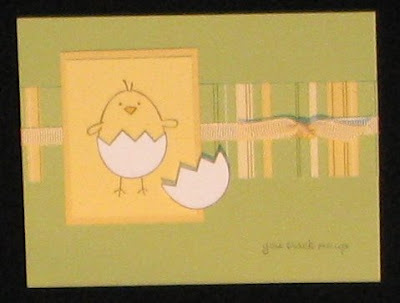 My first photo is for Lisa Babb's full card swap. 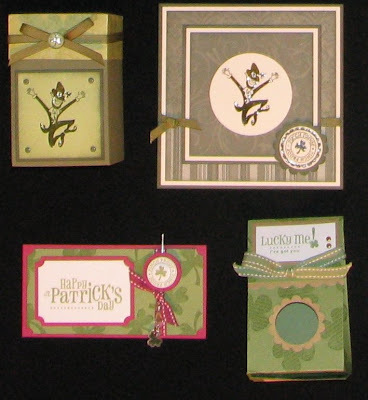 I decided to layer the 5-petal punch over the scallop punch (with textured cardstock), and then add some silver brads for extra interest. The pretty Berry Bliss Designer paper add some more colour, and all in add it was a fun one to create. Since the point of this swap is to create full cards that can be used, I kept it as a fairly generic invitation, so that the recipient could use it for a number of occasions, such as a personalized invite to an Opportunity Night, or team meeting. 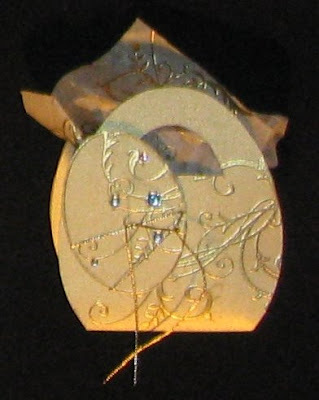 This card for Carol Norquist's swap was an exercise in glitter madness. I used the cool new Sticky Cut Letters for the die-cut double-sided sticky hearts, and then the red glitter from the new Chunky Essentials pack. I chose to first layer the glitter on Real Red cardstock before cutting each heart out, so that the red would be truly opaque. 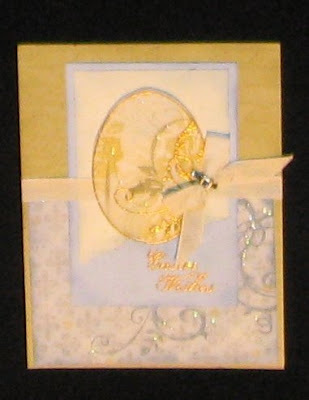 I was inspired by a card from Lorien Clark and knew I needed to see if I could pull it all together...do you like? Countdown to NYC/Bermuda...5 more days! 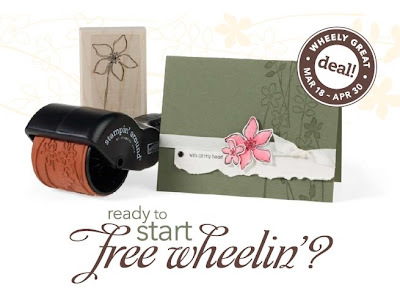 Okay gang... it's time to fess up to just HOW MANY freakin' swaps I have signed up for again for this year's Stampin' Up! cruise. Now, you must understand something first and foremost: swaps are supposed to be optional. 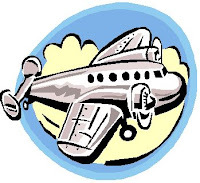 There's is no one holding a gun to your head saying that you must stamp yourself silly and near-blind the week before your so-called vacation, and make a bazillion swaps. Nope, no one at all. So I thought I'd kick off this final week before I leave with sharing the masochism that is my cruise-swap-addiction! 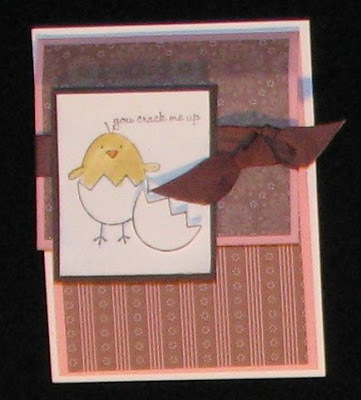 Today's featured card is for Amy Celona's card swap. I opted for a Dahlia-fold centre flower, multiple layers, a Paisley celery-on-celery background, and then a custom coloured ribbon slide to go on my grosgrain ribbon. I hope you like it! I got the idea on colouring in the ribbon slides from the ever-talented Patty Bennett. I just mixed a few drops of re-inker into a puddle of Crystal Effects, stirred it up and then "painted" the insides of my slides using the tip of a lead pencil. Total time is about 15 seconds per slide once you're in a groove, so it's actually pretty easy. A BTDT tip for you: the slides dry darker, so go lighter on the dye reinker if you need to adjust it. Let's see where the count gets up to when I add in some crazy glitter heart cards tomorrow! Countdown to NYC/Bermuda...6 more days! 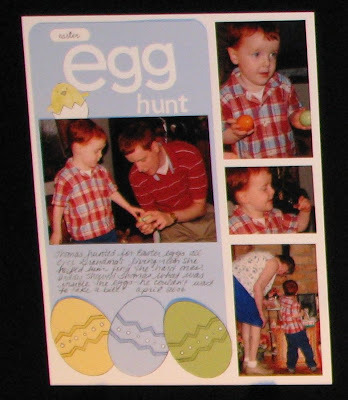 More Easter ideas for you! Yes folks, it's almost that time of year again! 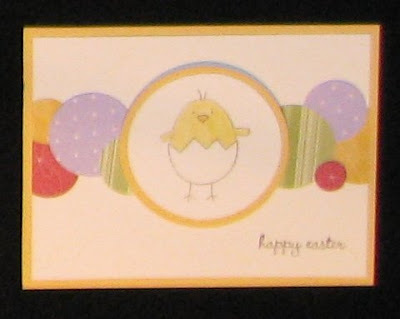 If you are looking for some Easter stamping ideas, here are a few for you... straight from the Leadership display boards. I have a few more up my sleeve, so come back again tomorrow if you'd like to check them out! p.s. If you live in Canada, why not sign up for my free e-newsletter? 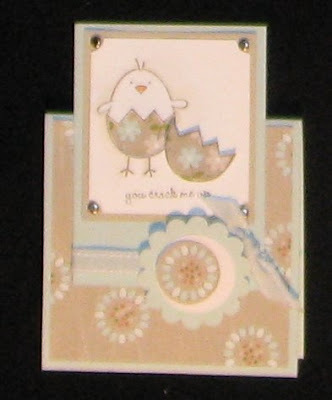 Then you can stay on top of all my latest Stampin' Up! specials, tips, ideas and more! Come visit me at the International Home & Garden Show! 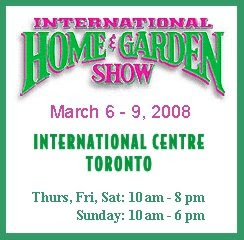 I'm at the International Home & Garden Show all this week, from today through to the end of Sunday. This is at the International Centre in Mississauga (free parking!) 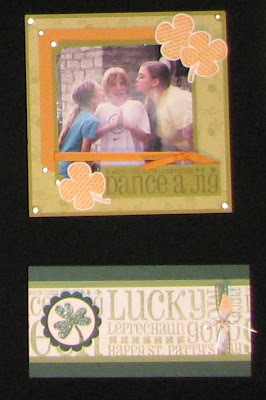 and I'll be exhibiting my Stampin' Up! wares at booth J49. Be good while I'm gone and as always, HAPPY STAMPING! And the ideas just KEEP on coming! Five fabulous scrapbook layouts from Leadership! 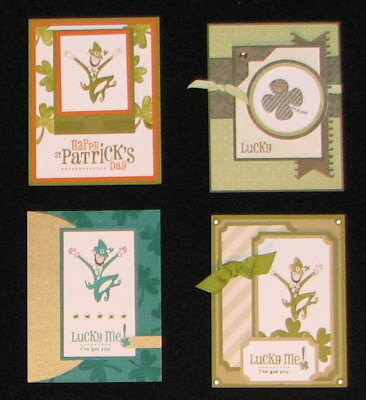 Here are some scrapbook page layouts for you to enjoy, straight from the Palm Springs Leadership event last month. Since I was flipping through the pictures I took that trip, here's one with me and my good friend Jennifer Tinline (she's the pretty blonde). She & her family will also be cruising with us in Bermuda, so I'm looking forward to hooking my monsters up with hers, and setting them loose at the kids club - LOL! 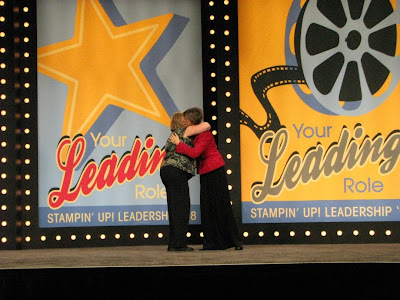 Now, those of you who were reading my blog this past summer when I went to our annual Convention in July might remember about how when Stampin' Up! gave away 10 free cruises to some of the lucky attendees, my downline Dina was one of the lucky winners and I just HAPPENED to catch a picture of her name up on the board. So now she and her family are also flying out of Toronto with us and cruising to Bermuda, and my 6yo son Morgan is just smitten with the picture's he's seen on little Elina so he can't wait. 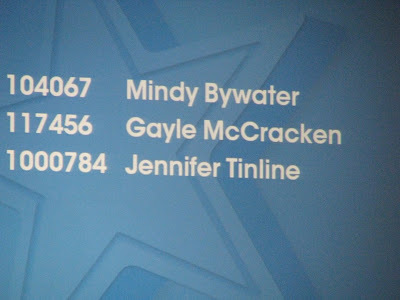 Anyhow, this time when Shelli (our CEO) announced they were giving away free CONVENTION registrations, I aimed my camera at the Jumbo-tron in the hopes that someone I knew's name would be listed. And sure enough... there was JENNIFER's!!! Yippee!! !